How many times have you heard the phrase “I never even knew that shop existed”? In fact, how many times have you said that yourself about a shop which has just never caught your eye, but has been mentioned in passing conversation? A bland and boring shop front can easily go unnoticed on a high street full of bustling crowds and other “in your face” retailers. If you want to attract customers, especially if you are a new business, then you need to stand out from the crowd. An attractive and bright sign just isn’t enough and often won’t cut it in our modern time where shoppers often don’t have the time to go into each shop to find out what they are about. You need to grab customer’s attention and convey what your business offers quickly and effectively. Window graphics and vinyl’s can transform your shop façade from dull and dreary to eye catching and exciting. They are an inexpensive way to attract the eye of potential new customers, as well as a creative and innovative method of getting across exactly what your business offers. If you are setting up a new business on the high street, then you want to clearly display just what you offer and window decals can do just that. Using images and text you can clearly display the products you offer, as well as displaying additional information such as enticing offers and discounts. While print and online media can give you certain amounts of coverage, there is only so much advertising and marketing you can do. You can give your marketing an extra boost with window graphics to promote special offers and promotions that will make passing potential customers curious about just what it is you provide. A well placed window graphic offering discounts or sales can bring curious shoppers through your door. Window graphics and vinyl’s can also help to create curiosity, as they can shield the inside of your premises from being completely seen. If a potential customer is intrigued by your window graphics, but can’t see straight into your shop, then they will come through the door to see what else you have to offer. Getting more bodies through the door increases your chance of sales and also increases your brand awareness through word of mouth, as the customer now knows just what you offer and will share that information with friends and family. Why stick to just your shop window? Decals and vinyl’s can be placed on company cars and vans and even your own personal car. Let your neighbours and the rest of your town know that your business exists and where to find you as you drive about on your daily errands. Often the simplest marketing efforts are the most effective. 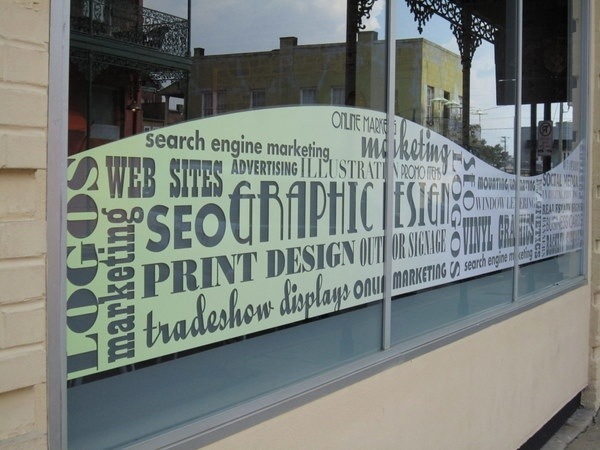 Sleek window graphics are eye catching and appealing and a sure fire way to increase your customer base.